The Equinox Framework component is tasked with being a full implementation to the OSGi Core Framework R4 specification. 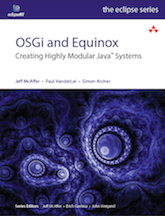 In addition, the Framework component produces launchers, bootstrap infrastructure and application models that facilitate the use of Equinox OSGi in end-user product scenarios. The Framework component consists of several "projects" in the Equinox GIT repository (see the resources page for information on repository location and access). The main framework project. This includes a set of adaptors and enough function to make a standalone OSGi framework. When built this project produces org.eclispe.osgi.jar. This helps setup the framework classloader and launches the Framework etc. Note: this code used to be included in the startup.jar and has be moved from its old location in the org.eclipse.platform project. See bug 113069 for more details. The launcher is the native executable that finds and runs the java launcher org.eclipse.equinox.launcher and thus the framework. It is also responsible for putting up the splash screen etc. The launcher is written in C and currently supports a wide range of operating systems, window systems and processor architectures. The launcher is split into a small native executable and a platform specific library. The source for both the launcher and the library can be found in the org.eclipse.equinox.executable project. The Framework team typically develops using Eclipse itself so getting and managing the projects is quite straightforward. Simply start Eclipse, and use Import > GIT > Projects from GIT. Enter the repo access information and choose the projects you want to load into the workspace. If you are working without Eclipse (gads! :-) then use your favorite GIT client and check out the relevant projects.